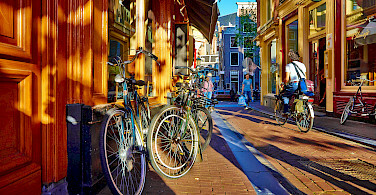 Cycle some of Holland’s most beautiful cities during the Tulip Season! This Southern Tulip bike and boat tour leads through some of Holland's most popular cities but also through fields of beautiful Tulips! 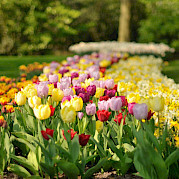 One highlight, among many, will be the Keukenhof gardens, the most beautiful flower garden in the world! 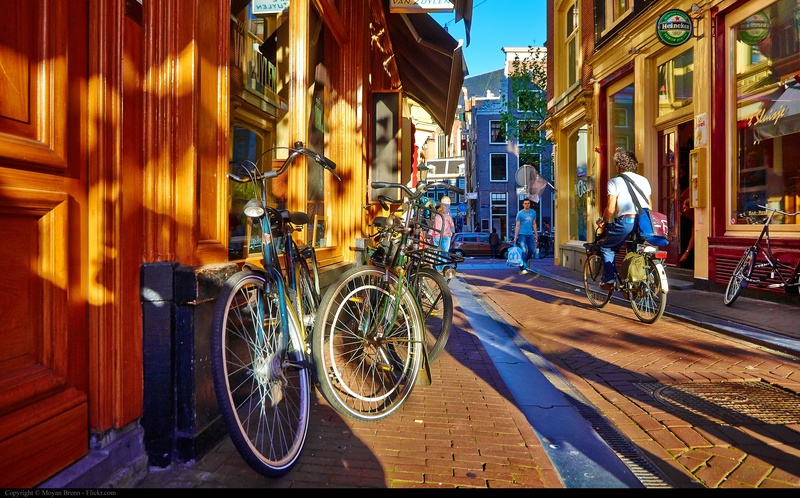 Your bike and boat adventure begins and ends in Amsterdam and includes the prestigious towns of Gouda, Delft, Leiden, and Haarlem. 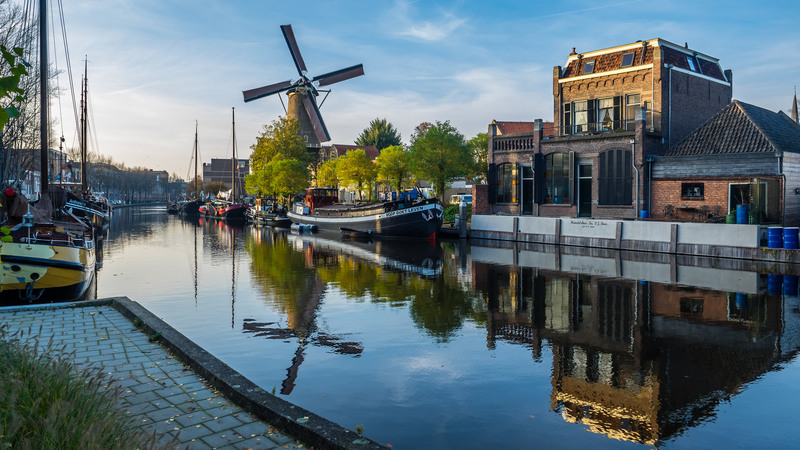 This tour truly allows you to sample the best of Holland: quaint villages, lively metropolises, tulips, canals, and biking! 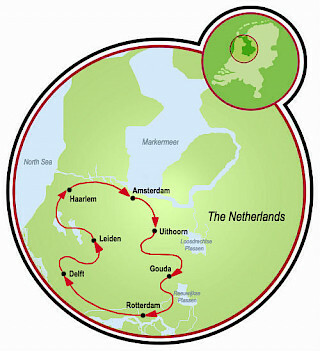 To browse all of our bike boat tours in the Netherlands, follow the link! Discounts available for children. Ask us for details. Please note: Pricing is based on fuel costs as of March 2018. If the fuel cost increase 5%, additional fees may apply (even for reservations already booked). There is a direct train that leaves 6 times per hour from the airport to Amsterdam Central Station. It takes about 16 minutes. The price for a train ticket Schiphol-Amsterdam Central is € 4,20 per person for a single journey. The barge will be moored at the Oosterdock. Walking distance to the barge is about 10 to 15 minutes. 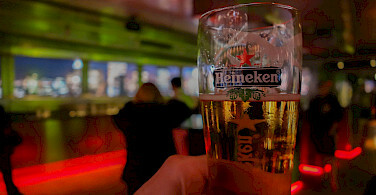 A taxi from the airport to the barge in Amsterdam takes about 30 minutes and costs approximately € 45. If you wish to take a train from the central train station to the barge it will only take about 5 minutes and will cost approximately €10. Please check local conditions prior to arrival. 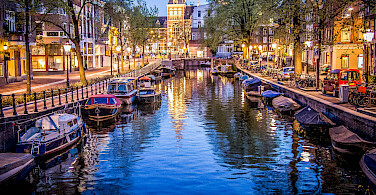 Holland is near or below sea level and experiences a Maritime climate influenced by the North Sea and Atlantic Ocean with relatively mild winters and summers that are not too hot. 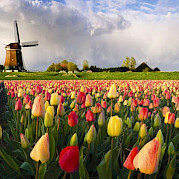 Holland has the perfect climate and soil for the Tulips. 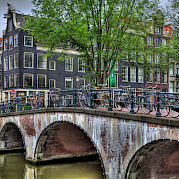 Average high/low temp in °F for Amsterdam in April is 53°/41º and May 61°/46º. Don’t forget your rain gear! Please be aware that you will be part of an international group of people, but your tour guide and crew members will always speak English. Tulip season in Holland extends from the end of March to middle of May but is totally dependent on temperatures and the weather. 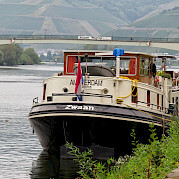 For this tour different class boats are used on different dates. Please see dates and pricing. Easy, guided tour with variable cycling distances per day in and around interesting cities and towns. *All distances are approximate. This itinerary is subject to change, even on very short notice, due to changing wind and weather conditions and other unforeseen circumstances having to do with mooring requirements, docking location changes, lock repairs, etc. Embarkation on Saturday between 1 pm and 2 pm. The barge needs to leave the mooring place in Amsterdam at 2:15 PM. It is very important you are on time. The barge can’t wait due the opening hours of bridges and/or locks. You can begin to board at 1 pm but can bring your luggage on board at noon. Do note that the crew will be busy preparing for you so you will not be able to check in to your cabin until 1 pm. The barges will be moored at the Oosterdok near the Nemo Science Museum. During dinner on board, the weekly program is discussed. 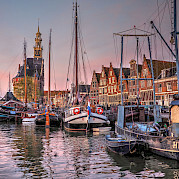 After dinner, you will have a short bike tour around Oude Wetering. 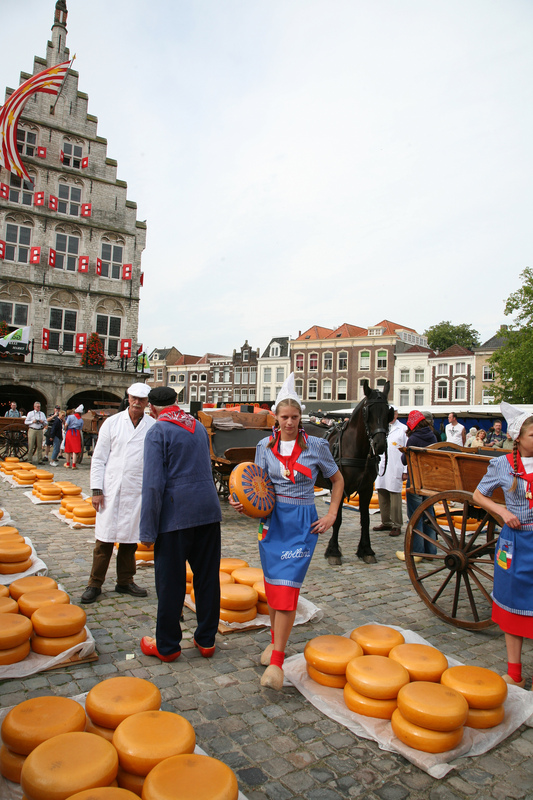 From Oude Wetering you will continue your tour over country roads, along river banks and channels through the Green Heart to the city known for its cheese: Gouda. 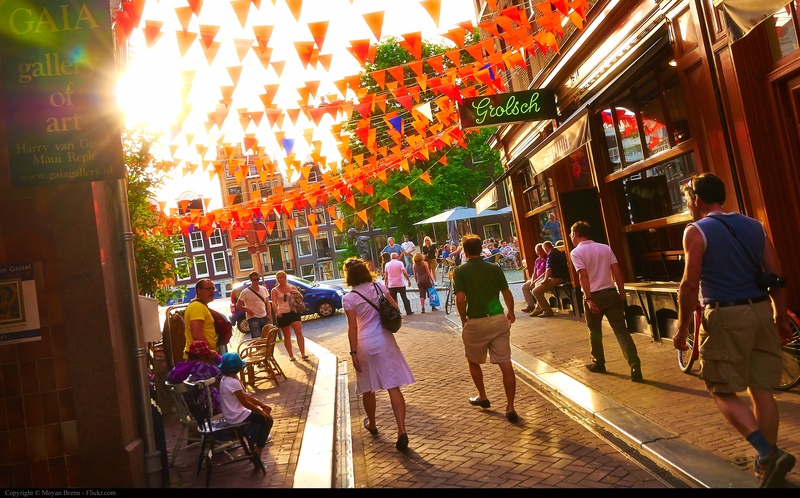 Who thinks of Gouda, not only thinks of cheese, pipes, ‘stroopwafels’ (treacle-waffle) and pottery, but also of beautiful stained glass windows, a fairy-like town hall and atmospheric canals. 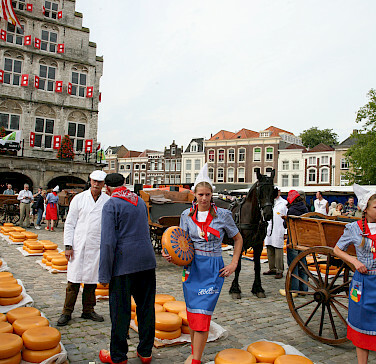 Gouda is a beautiful Old Dutch city with a mostly intact city center. As on most days, after dinner, you can take a walk through the city. 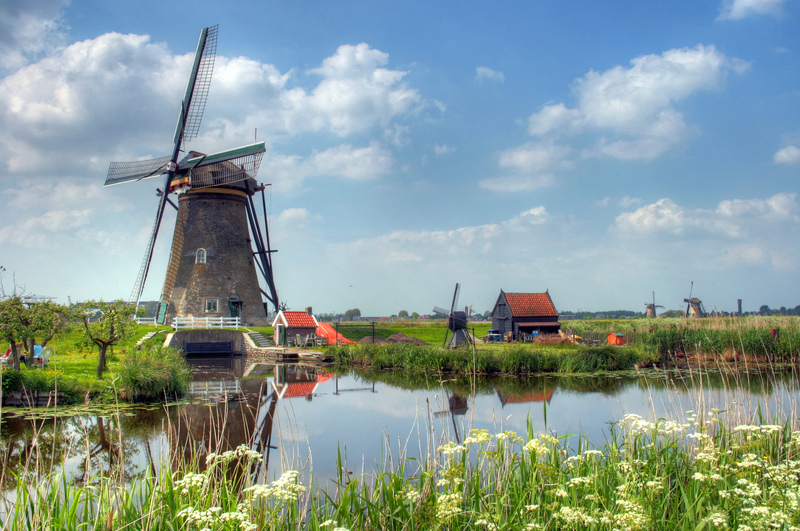 From Gouda, you cycle past scenic polders via Kinderdijk to Rotterdam. 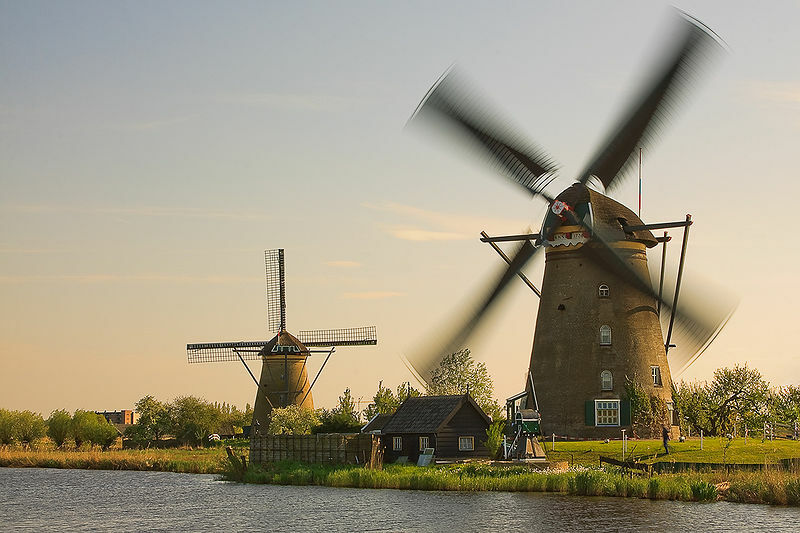 Kinderdijk has the largest group of windmills in the Netherlands. 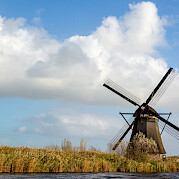 The windmills at Kinderdijk were still actively used until 1950. These days, a large pumping station is responsible for controlling the water level in the polder. From Kinderdijk you take the ferry to Rotterdam where the barge is waiting for you to take you to Delft, famous for its pottery, the ‘Delft blue’. The Prinsenhof Museum is housed in the former St. Agatha’s monastery. In 1572 William of Orange chose the convent as one of his residences. 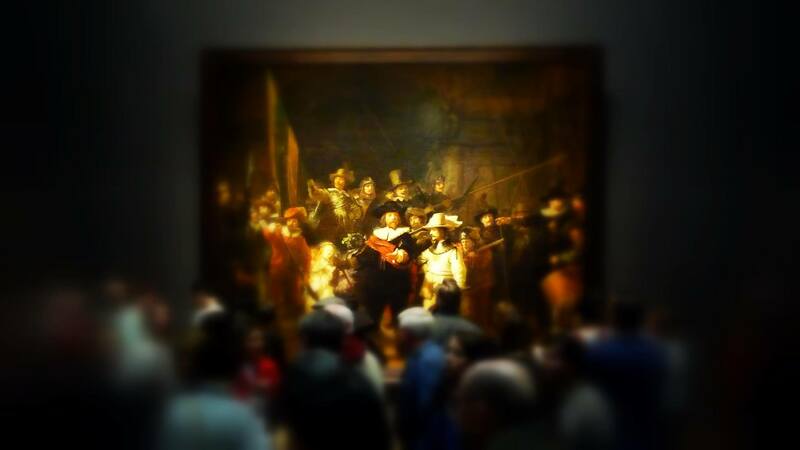 It was from here that he led the revolt against the Spanish tyranny of Holland. He was murdered on the steps of the Prinsenhof on July 10, 1584, by Balthazar Gerards, a Spanish sympathizer. Two bullet holes in the wall of the stairs bear witness to this event. From Delft, you will cycle Holland in the direction of The Hague, through the Haagse Bosch, a large park, and past the Royal Huis ten Bosch Palace. A tranquil cycle path through the dunes leads you to Wassenaarse Slag. Here, some remains of the Atlantikwall can still be seen. The Atlantic Wall was an extensive system of coastal fortifications built by the German Third Reich in 1942 until 1944 during World War II along the western coast of Europe to defend against an anticipated Allied invasion of the mainland from Great Britain. Five bunkers are connected by nearly 3,000-foot long brick tunnels. Now, this underground network serves as a bat reserve! It was nearly 1,700 miles long. This defense line, which was never completed, not only consisted of bunkers but also of canons and mine fields. At some places, the bunkers are still there, such as in Zandvoort, Scheveningen, Oostende (Belgium), and Normandy (France). Continuing on through the dunes, to Katwijk aan Zee, an old fishing village (the inhabitants still speak their own dialect called Kattuks), you will follow the course of the Oude Rijn (Old Rhine) ending in Leiden. 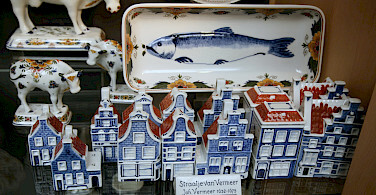 Leiden originated around 800 AD as a marketplace at the confluence of the Old and New Rhine rivers, the Vliet river and the Mare (‘Leyten’ means ‘at the waters’). 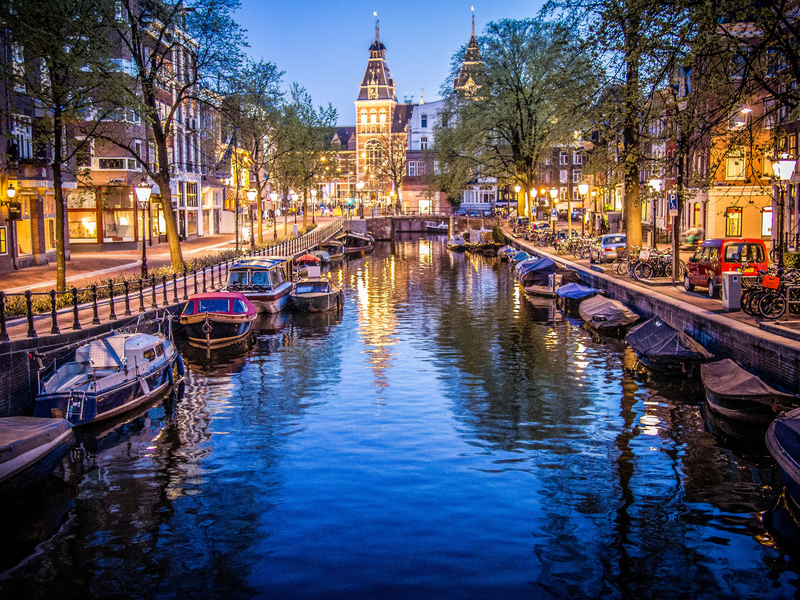 For a long time, it was the second city after Amsterdam. It was the center of the textile industry in Medieval times. A well-known episode from the history of Leiden is the siege of 1574 by the Spanish. These were finally driven away after dikes had been broken through and a Watergeuzen (see Rotterdam) fleet had come to help. 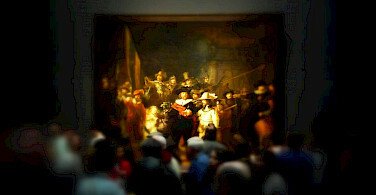 Leiden is the birthplace of Rembrandt (van Rijn!). It boasts 14 museums, including the Rijksmuseum for Anthropology with many priceless foreign objects, the Municipal Museum (Lakenhal, 1640) including works by Dou, Steen, Rembrandt, and Van Goyen, the Rijksmuseum of Antiquities with Egyptian antiquities. The Hortus Botanicus (Botanical Garden), a 400-year-old garden with innumerable exotic plants and trees, is certainly worth seeing. In the center of town, you can go shopping or enjoy sitting on an outdoor terrace on the water’s edge. 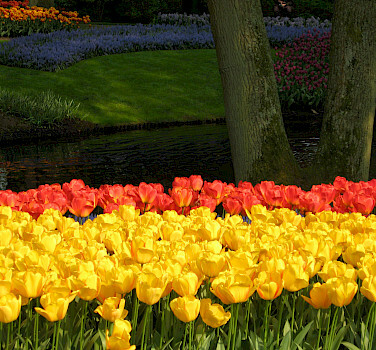 Today you visit the Keukenhof gardens, the most beautiful spring park in the world. The Keukenhof is the place where the spring breaks. 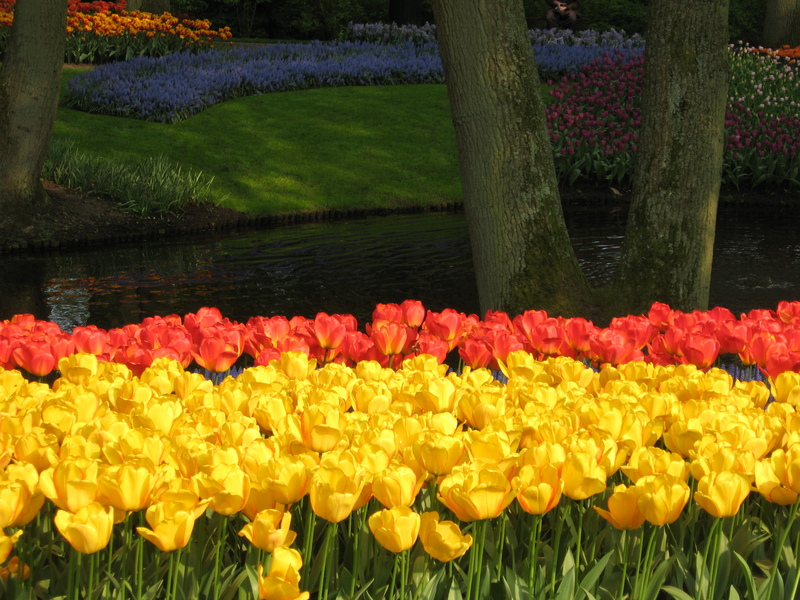 In the Keukenhof various gardens and gardening styles can be found: the English Landscape Garden, the Historical Garden, the Natural Garden, the Japanese Natural Garden, the Formal Garden and three special colors gardens. Spread throughout the entire park there are approximately eighty sculptures from well-known Dutch artists as well as several other art objects, such as the collection 'Surprising Tulips'. From Leiden, you cycle through wonderful flower beds in the direction of Haarlem. In the period of March to May the bulb fields are blooming, starting with daffodils and followed by hyacinths, tulips, and lilies. Once in the city of Haarlem, you make a short tour through the city to see some typical 'hofjes' (almshouses), old houses around a central courtyard, now usually housing elderly people. 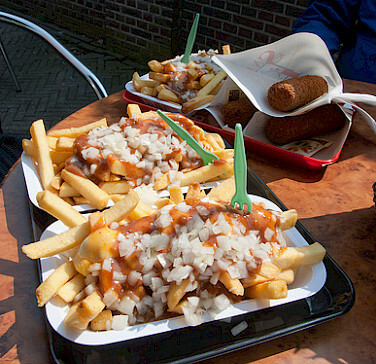 These 'hofjes ' are definitely worth a visit. 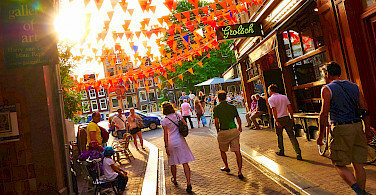 Haarlem, which rendered its name to Harlem, New York, is a lively city with good shopping possibilities. 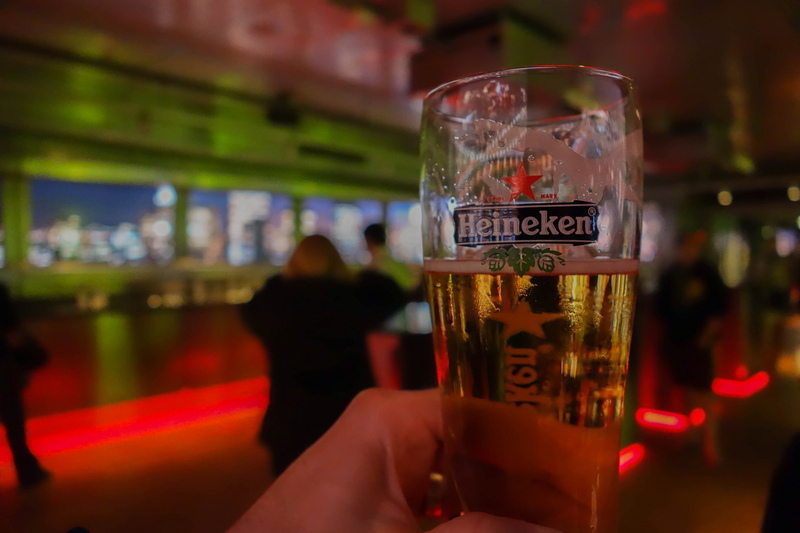 The ship is berthed in the city center, with a view of St. Bavo's Church and with easy access to the Grote Markt with its many outdoor cafés. 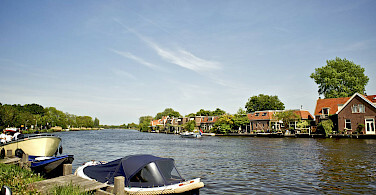 From Haarlem, you sail to Spaarndam, a picturesque village on the edge of Haarlem, in the direction of Amsterdam. 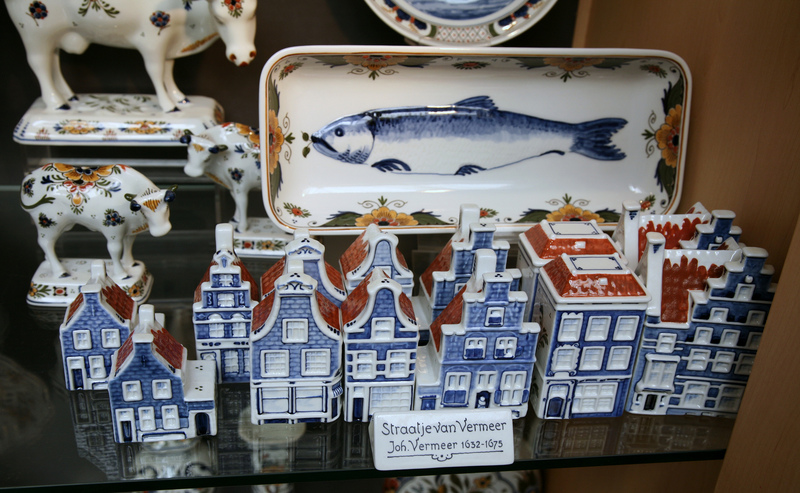 Spaarndam’s name comes from the dam built in the Spaarne river to limit the danger of flooding from the sea. Here you can find the statue of Hansje Brinker on the IJdijk. Hansje is a character from an American novel, who saved the country from flooding by putting his finger in the dike. 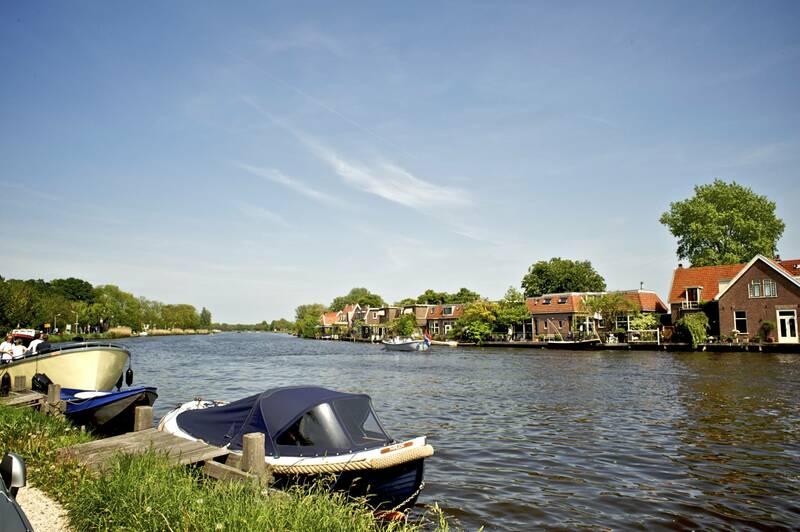 The Buitenhuizen ferry takes you across the North Sea Canal and from there you cycle to the Zaanse Schans. The Zaanse Schans, with its traditional weatherboard houses, warehouses and windmills may give you the feeling of stepping back into the 17th or 18th century. Yet this is no open-air museum, but a lively neighborhood where people live and work. Among other things, a cheese farm, a clog maker and an old bakery can be visited here. I loved being part of the Southern Holland Tulip Tour! The biking was wonderful, the scenery was unparalleled, and the Sailing Home was comfortable and well appointed. Staff was uniformly pleasant and accommodating. I enjoyed bonding with the other riders in the group , mostly from the Central and Western US and Canada. Our guide was knowledgeable and entertaining, however I feel that keeping our large group of 26 riders together on the rides was a challenge, and he would have benefited from the use of "corners" to make sure that all the riders were clear on the turns. Also, we were each given a booklet with the daily ride routes, but it would have been helpful to go over the next days map each evening so that we could visualize the lay of the land. Great trip all around and I am hoping to join another in the future! We came to see the tulips and that was definitely accomplished. Albeit a bit late for most of the major fields, but Keukenhof was spectacular. Cycling through the polders and quiet countryside was also very enjoyable. On the negative side, the last days cycling into Amsterdam and departure from the boat was a bit rushed. Loved the comfortable accommodations on the barge. The biking and scenery was amazing. The collective group, including staff, became family. The best was the fields in bloom with tulips and such. Wow! This trip was absolutely wonderful. Even with a day or two of challenging weather.....with the right clothes it didn't matter. 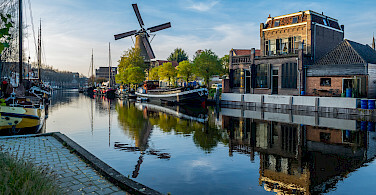 We were surrounded by such beauty every day and the people of the Netherlands are top notch.....you really couldn't find people that are sweeter and friendlier anywhere. Five Star Plus!!! Loved it all! Wonderful staff, wonderful route, wonderful fellow passengers, wonderful guide! We could not have asked for anything more except less wind as we rode through the windmill area into a very strong headwind! Hardest day's riding we've ever done! 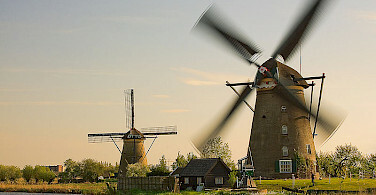 But hey, this is Holland renowned for "wind"mills!! Keukenhof was amazing, everyone should visit this place once in their lifetime! It all started with you and our experience with you sealed the deal. You added a personal quality that is Read more… much appreciated. The weather was great except for one windy and chilly day. Our tour guide, Albert, adapted the ride to the level of the riders yet still taking us to the important places and showing us the best of the countryside. Our hosts could not have been more hospitable, making all of the participants feel more welcome than just paying customers. We even had a last-minute gourmet chef! And we got to help welcome the new dog on board - all the guests were dog lovers and were delighted to meet him. We recommend this trip to anyone who likes an Read more… active vacation in a beautiful setting with good food and company with similar interests. 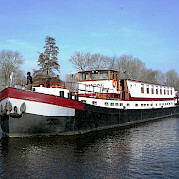 Wending Netherlands Standard Class Boat The Wending is a former freight barge that was converted into a luxury passenger motor barge in the early nineties and completely redecorated in 2002. The barge has a spacious salon equipped with a television and music installation. It is a great place to relax after a strenuous day of cycling. Sailing Home Netherlands, Belgium Premium Class Boat Built in 2001, the Sailing Home was designed specifically to provide a more attractive hotel ship during your carefree vacation. It was built to meet the latest wishes and ideas with respect to comfort and service. The experience of a lifetime: cycling through the most beautiful spots within the Netherlands while residing on a very comfortable, newly built and well-furnished ship. Feniks Belgium, Netherlands, France Standard Class Boat Originally, the Feniks was built in 1928 as a freighter on the Dutch, Belgium and French inland waters. 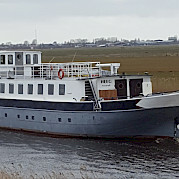 In 1992, the Feniks was converted to a hotel passenger ship and put in service for various sailing holidays. Since then, she has undergone several renovations to keep up-to-date with all modern facilities. Zwaan Belgium, Netherlands Standard Class Boat Once a cargo boat, the Zwaan (Swan) was completely renovated and converted into a comfortable passenger barge. On board you will find seven comfortable cabins allowing a total capacity of 16 passengers.